The Dhaka Art Summit in Bangladesh was pressured by Chinese Ambassador Ma Mingqiang into taking down an installation by Ritu Sarin and her husband Tenzing Sonam, a Tibetan exile. The installation, titled “Last Words”, showcased five messages of Tibetans, who have self-immolated in protest over China’s occupation of the region. 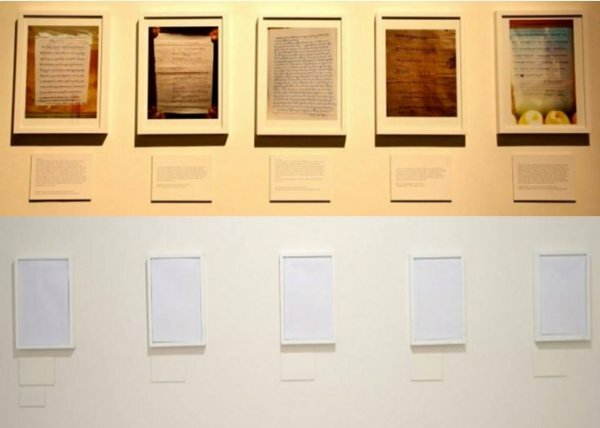 The organisers of the exhibit covered up the five frames with sheets (with the artists’ consent), after receiving pressure from the Chinese Ambassador following his visit to the exhibit on 6 February. Pictures courtesy of @Wasfia Nazereen’s Facebook Page. The third edition of the Dhaka Art Summit took place 5-8 February 2016 and featured paintings, performance art, film screenings, and book launches. The annual event, hosted by the non-profit Samdani Art Foundation, showcases South Asian art and brings together hundreds of artists, scholars, curators and visitors from around the region and the world. What's considered art in one place, however, can be seen as political heresy in another. Such was the case with one of the summit's multimedia installations. Created by Indian filmmaker Ritu Sarin and her artist husband Tenzing Sonam, a Tibetan living in exile in Dharmashala, the exhibit centered on those in Tibet who have self-immolated in protest of China's dominion over the region. The installation, titled “Last Words”, consisted of facsimiles of five last messages along with their English translations written by people who self-immolated. These messages were part of a larger multimedia exhibit by Sarin and Sonam on Tibetan self-immolations in the past six years, which the duo inaugurated in Delhi last December. Chinese Ambassador to Bangladesh Ma Mingqiang visited the exhibition on Saturday, 6 February and reportedly “exploded” at the sight of the Tibetan art installation, asking that they be removed immediately. Later, he sent the organisers a mail-in protest and requested that the works be taken down. The organisers obliged by covering up the five frames with white sheets with the artists’ consent. In what was probably a subtle act of defiance, the artwork was covered up but left hanging on the wall. Tibetans accuse China, which incorporated Tibet into its territory over 60 years ago, of religious and cultural persecution. The region has seen several large-scale uprisings in that time, and dozens of people in recent years have self-immolated in individual protests against Chinese control. China keeps Tibet firmly in its grip by heavily censoring the Internet, controlling media and restricting access to tourists and international press. This is not the first time the Chinese government has tried to shut down Tibet-related exhibitions. In 2009, Chinese pressure resulted in the closure of a photography exhibition on Tibet named “Into Exile | Tibet 1949-2009” organised jointly by Students for a Free Tibet–Bangladesh and Drik Bangladesh. “Do not encourage or give a platform to any opinion, narrative or voice that runs counter to the official Chinese line, particularly when it comes to Tibet or Xinjiang.